AJC-117-SGS(S), SUPER SHING-GO TEAR-OFF SHOVEL. 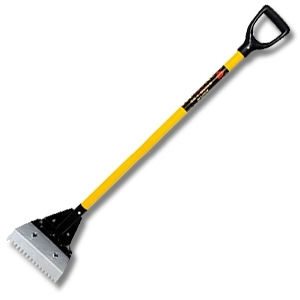 Features a 47 1/2" top grade fiberglass handle with D-Grip. Body has extra brace reinforcement. Includes a carbon steel heat treated skid plate to reduce wear on fulcrum of shovel. SHING-GO # 115-SGH(S) 40 in. FIBERGLASS REPLACEMENT HANDLE. PRICE/EACH. AJC # 115-SGH Wood Replacement Handle. Price/Each. AJC #114-SKID Replacement Shingo-Go Skid. Fits any standard AJC Shingo product. Price/Each. AJC #116-SGB Shing-Go Shovel Replacement Tear-Off Blade (1). Price/Each. AJC #116-FTB WIDE-FORK-TOOTH SHING-GO (shingo) REPLACEMENT BLADE. PRICE/EACH.